Raw salads are a welcome change after Christmas. This brussels sprout coleslaw is perfect for using up left over ingredients you may have in the fridge. It’s the tail end of the Christmas bag of sprouts and although I will certainly buy more during the winter, I feel I ought to do something interesting with the six lonely ones left. 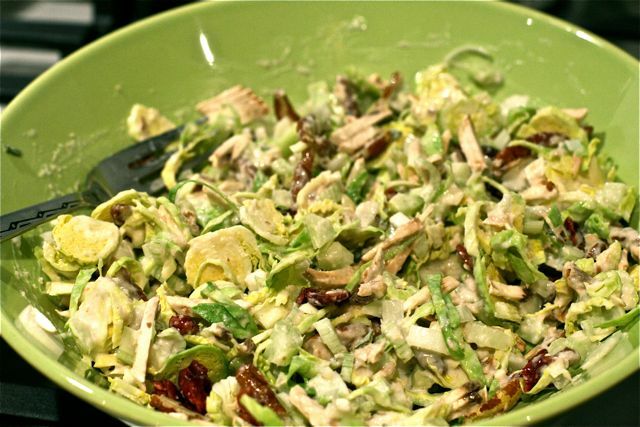 This brussels sprout coleslaw was inspired by a leftovers suggestion in this month’s Delicious magazine. Assembling this from memory the ingredients are completely different apart from the thinly sliced raw sprouts and horseradish factor….